When it comes to simplicity, flat pedals are the king. While locking in to clipless pedals can deliver efficiency gains and greater speed, they also restrict movement and can cause joint pain or hotspotting if you don’t have everything dialed in right. Flat pedals give you more support and the freedom to adjust your footing at will, which makes them perfect for all-day tours or singletrack adventures. But things have been complicated by the introduction of alternative pedal sizes, sparking endless debates about what size of flat pedal is best. Some people say bigger is better, while others insist that you need the smallest platform with as much clearance as possible. So how do you figure out which flat pedal is right for you? Well, there are a few key things to consider before we get into the nitty gritty of how to find your flat pedal size. What are your personal needs and performance goals? The size of your flat pedals directly impacts how your bike performs and how you perform on it. For example, a larger pedal may give you more support and control on your mountain bike, but it will also have a greater chance of striking obstacles or dragging in the dirt around a tight turn. Likewise, a smaller, lighter pedal might be helpful for a fully-loaded tourer, but if they cause discomfort after only a few miles, then the extra grams of weight-loss might not be worth it. So you want to balance your personal needs with your performance goals when choosing your pedals. In general, you’ll want to get a pedal that is big enough to support your whole foot, without taking up any unnecessary weight or space. And that means finding a pedal that is made to fit your own two feet. 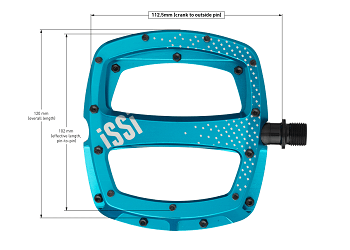 At iSSi, we offer a selection of three different sizes of flat pedals to help fit different types of riders. No matter what kind of riding you’re gonna do, getting solid footing on your flat pedals is the key to safety, control and effective power transfer. So all of our flat pedals are designed with a central concavity that your feet can easily sink into. This spreads your weight out across the entire surface area of the pedal and helps the pins dig into the edges of your sole to secure your footing at every angle. But if the pedal doesn’t fit, then you’ll find your feet either sitting on top of the pins and slipping off or sitting between them and sliding around inside the cavity. Obviously, neither of these are ideal, but finding the right pedal size for your own two feet can be difficult if you’ve never tried them before. Thankfully, there are a few ways that you can find your pedal size before you buy. The concave dip in the center of the Thump S.
The first step of any two-wheeled journey is choosing where you want to go. And knowing how and where you’ll be riding will be the best compass to help you find the right flat pedal for the trip. When comparing different pedal options, you should consider what kinds of obstacles you might encounter and how you will approach them. For example, if you are planning an all-day bike-packing trip on gravel roads, you may want a lighter pedal that will be comfier long-term, like our Thump pedals. 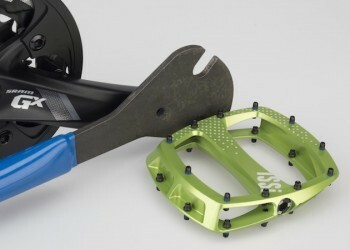 Whereas if you are going to be racing down a rough mountain trail you will want a pedal with big, grippy pins that is tough enough to handle a few rock strikes, like our Stomp XL pedals. You should also consider other environmental factors like weather, pedal clearance needs, trail condition, and safety ratings. You can find the safety ratings for all of our pedals in the Intended Use section of their respective instructions, which can be found on our Safety Page, so be sure to check and see what kind of activities each pedal can handle before you put them on your bike. Once you know what your trip will throw at you, you can prepare with the best pedals for the job. An example of the ideal pedal stance width. The first step to finding the right flat pedal size is to compare them to your own shoes. Picking the recommended pedal for your shoe size will help optimize bike control and comfort without taking up extra clearance space. Each of our flat pedals suits a range of shoe sizes, with the Thump S is fitting riders with smaller shoes (US Men’s 9/Women’s 11 or less), while the regular Thump is for bigger feet (US Men’s 9/Women’s 11 and above), with the Stomp XL sitting at the upper end of that spectrum. It is pretty simple on its face, but for those who fall into the grey areas between each of these pedals, there is one more thing you can do to help. 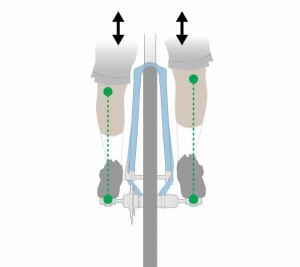 Finding where your feet naturally fall on the pedals can further refine your pedal fitment. 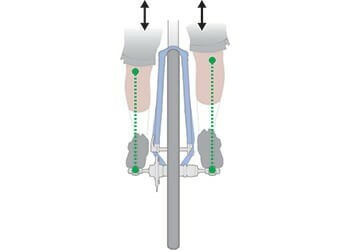 Much like with clipless pedals, the balls of your feet should typically fall into the concavity in the center of the pedal, and your knees should stay directly above your feet at the top of each pedal stroke. This is your ideal Stance Width (learn more about it here). A professional bike fitting from your local shop will find this for you, but if you already have a pair of pedals that feel good on a bike that you like, you can use those to get an estimate. To do this, simply measure the distance from the outside of the crank arms to the center of each pedal and combine it with that bike’s Q-Factor (the distance between the outside of each crank arm). This will give the number that you’ll be shooting for. The overall size of each of our pedal designs slightly changes where your feet should rest on them. The center of the Thump S is 59mm from the crank arm, while the regular Thump is 61mm, and the Stomp XL is 65mm. So you can pick the platform that most closely matches the pedals you already like, or you can plug these measurements into your Stance Width formula (Spindle Length x 2 + Q-Factor = Stance Width) to find your Goldilocks, just-right comfort zone. The effective Spindle Length measurements of the Stomp XL, Thump and Thump S.
Once you’ve found the right flat pedal for you, all that’s left is to choose the color that fits your own personality. But we don’t really know anything about that. We just make pedals. For more helpful “How-Tos” check back here soon. True Concave and Pedal Shape: why thinner pedals aren’t always better.